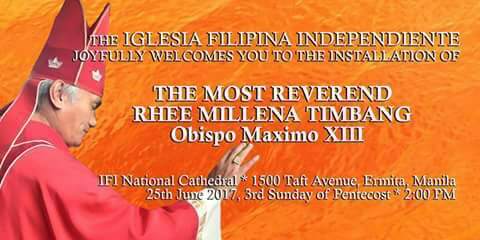 On June 25, about 2,000 bishops, priests and faithful of the Iglesia Filipina Independiente from its 45 local churches will gather at the National Cathedral in Manila for the installation and enthronement of the Church’s new Obispo Maximo, The Most Reverend Rhee Millena Timbang. Archbishop Timbang, who is the Bishop of Surigao and the past immediate President of the Supreme Council of Bishops, was elected the 13th Obispo Maximo during the Church’s 14th Triennial General Assembly in May 2017. He will replace The Most Revd Ephraim Fajutagana who served from June 2011 to May 2017. The Service of Installation and Enthronement will take place at the IFI National Cathedral, 1500 Taft Avenue, Ermita, Manila, Sunday, at 2:00 o’clock in the afternoon. The Service will also see the Oath-taking and Induction of the members of the Church’s 14th Executive Commission. The 13th Obispo Maximo, who is elected for a six year term of office, is also joined by newly elected officers of the Church which include Bishop Joel Porlares, General Secretary, Mr. Saturnino Garvida, General Treasurer, and Mr. Reynaldo Evangelista, Auditor General. Archbishop Timbang will preside over the first regular meeting of the Church’s Executive Commission on June 28-29. The Executive Commission meeting will be preceded by an Inter-Commissions and Sectoral Organizations’ Meeting on 26-27 June. Ecumenical Women say: Yes to Peace Talks, No to Martial Law!